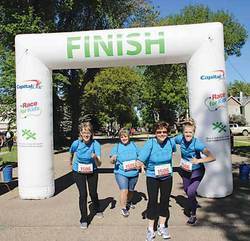 On Saturday June 1st, 2013 the street just north of the Boys and Girls Club at 5109 51 Street in Wetaskiwin was closed to traffic but filled with motivated teams representing local businesses and organizations lining up for the 2nd Annual Capital One Race for Kids event. Wetaskiwin is one of 22 communities across Canada chosen to participate in the race. Teams of four competed in 10 themed challenging checkpoints, Sweetly Twisted, Wetaskiwin Carpet Centre, A&W, Norm Brown Field, Co-op Country Junction, Flaman Fitness, Wetaskiwin Heritage Museum, Easyhome, Jubilee Park and ended at the Legion. The checkpoints were designed to incorporate activities that focus the mind and challenge the body. Challenges were not based on athletic prowess or mental superiority; rather, they were designed for fun and building teamwork. Think of it as the perfect combination between The Amazing Race and Minute to Win It. All 4 members of each team paid a registration fee of $10/person and each team raised a minimum of $360 to participate. Although the “Race” is a national fundraising initiative, funds raised locally stay in Wetaskiwin to help support local children and youth programs. Teams were eligible for prizes of (in-kind) $2000, $1000 and $500 in the competitive Emerald section and $1000, $500 and $250 in the ‘out for the fun of it section. The Boys and Girls Club is grateful to the sponsors; Flaman Group of Companies, Wetaskiwin A & W Restaurant, Boston Pizza, Canalta Power System, Fon-Tel Communications Ltd., Kinette Club of Wetaskiwin, Magnum Mechanical, Peter's Insurance Agencies, Pioneer Chrysler Ltd, Tom's Town & Country Plumbing & Gasfitting Ltd., Wetaskiwin Elks Lodge #91, and Wetaskiwin Lodge #1559 Loyal Order of the Moose. Participants, volunteers and our sponsors had opportunity to exchange stories about their adventure at the post-event Celebration BBQ. The Boys and Girls Club of Wetaskiwin provides a safe, supportive place where children and youth can experience new opportunities, overcome barriers, build positive relationships and develop confidence and skills for life. The Boys and Girls Club of Wetaskiwin was established in 1988 as a society as a much-needed community based service for children, youth and families in the City of Wetaskiwin and area.